Home » Kitchen Help Category » Readers and Their Kitchens » Matchy matchy kitchen magic for Jacquie, but what is the name of this GE brown? 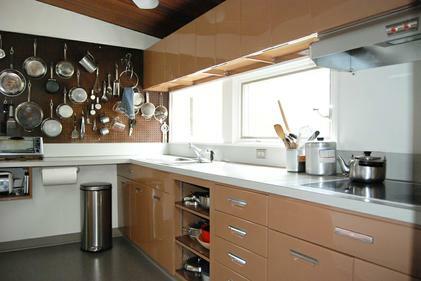 Matchy matchy kitchen magic for Jacquie, but what is the name of this GE brown? Jacquie wrote me, all excited after the retro decorating gods delivered this lovely vintage brown GE stove unto her. Its color is exactly the same as the cooktop and oven original to her house, so she is thrilled to have the matchy matchy magic goin’ on in her kitchen. Oops: Well, she still needs the fridge…. Meanwhile, she wants to know: What is the name of this color? Yo no lo se, but I do know that we have some GE-expert readers… Patrick? … so perhaps you can help Jacquie out with this question, and any other tidbits? 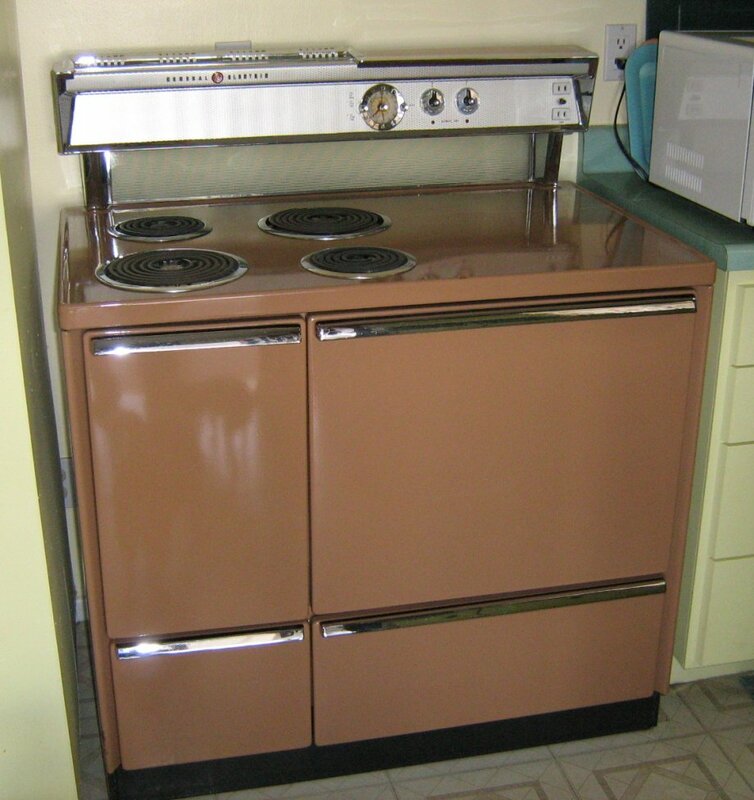 I am baffled trying to find a vintage GE range color name and it is driving me crazy…maybe you can help. We live in a late ’59, early 60’s built home,…plaster walls, block, and I do have a lot of little gems to share with you….like a radiant heater in the ceiling that we used this winter for the first time. (We bought the house in April 2009), so I have only been here for a year, but we have done quite a bit, and there is more to do all the time, I am sure you know that!! I have the full size range now, the counter cooktop, and the eye-level oven all the same brown color, and it is not coppertone. It is more like a chocolate cocoa color??? The bigger free-standing stove came just last week after I saw an ad on CL here in Mesa AZ from a man who had taken it out of a woman’s house in the downtown area …she had changed from electric to gas. (He told me these things when I called him!) She even cooked breakfast on the stove for them before they renovated her kitchen. She just wanted it out, so he took it home and garaged it, then posted the ad. The man who sold it to me also threw in a hood, it is a “Ranger” needs lots of cleaning, haven’t started that yet, but I would like to put it over the stove if possible. Not so sure of the year of the stove, but with the color the same as is in my house, there can’t be much of a difference ..possibly 1959-1960? I would LOVE to find a matching FRIDGE!!! Maybe I will be blessed and find one someday. That color…it is different, don’t you think? You will be happy to know that my husband and I have gotten mostly everything from auctions, ads on Craigslist, and Re-store or Stardust Building Supply here in the valley of the sun. Thank you for being attentive and helping all who will listen to have the foresight to “recycle” the right way…this history is to be cherished and protected. I love the color, Jacquie, and it is so cool that you have the growing and near-complete set. GE Friends, what do you think? 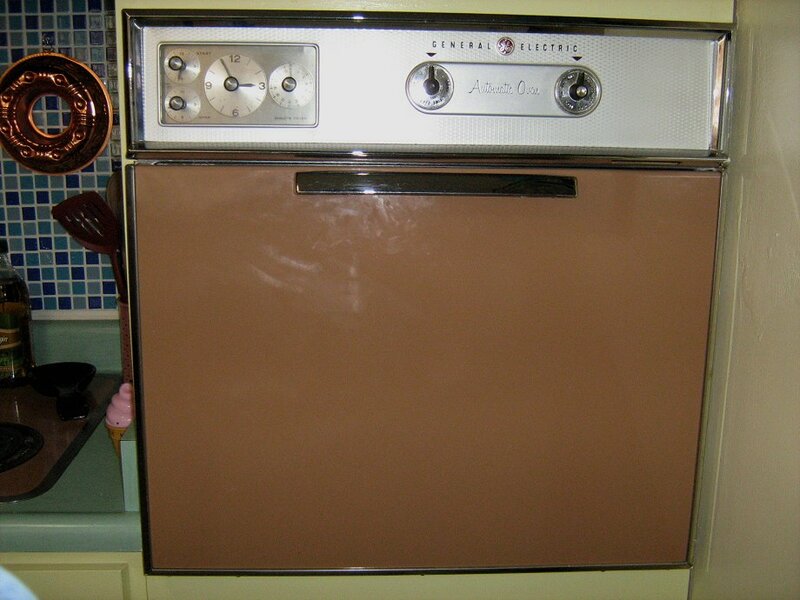 What’s the name of this classic appliance color? Help! 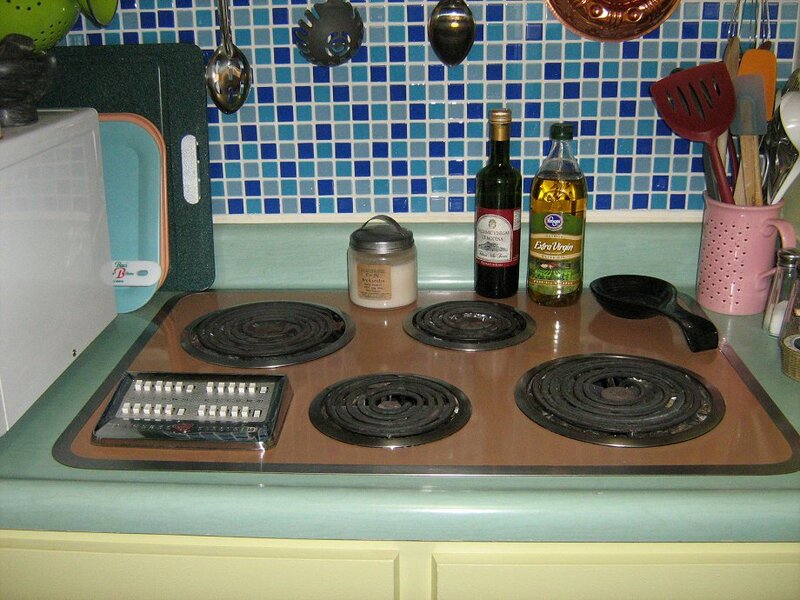 I’m trying to find drip pans for my 1958 GE cooktop. It’s just like the one in your picture except that it is turquoise. The universal-fit drip pans from local vendors don’t work with the vintage hinged coils. Did you have yours replaced? I have the same built-in GE single oven! I need a thermostat for it but the Model & Serial #’s are destroyed on the name plate. Can you read your name plate and tell what the alpha/numeric information is? PLEASE! I need to fix this before Thanksgiving 2014! Allen, this is a really old story, very unlikely that Jacquie is monitoring. Please see our FAQs – the folks at the TOAC or another of the forums dedicated to appliances may be able to help you. Good luck. It’s not ‘brown.’ GE calls it Copper ! I have one just like it. Mine’s a 1964 model. The model number is located in the face of the big oven when you open the door. You can call GE service at: 877.959.8688 and ask them the name of that ‘brown’ color. I was flabbergasted. Never knew a copper that dark. Jacquie, I have the same brown GE push button stove top and I need to know the MODEL NUMBER in order to get a burner for it. Please, let me know if you know the model number or know the information regarding ordering a new burner. Thank you. Wellesley, try The Old Appliance Club. My oven hood is dark brown, however, but it has the buttons as opposed to the range because apparently people would accidentally bump into them and turn on the burners without realizing it? I love it, but the fridge is missing and my husband won’t let me have an old one.